For a decade, Amy Dickinson has been the <i>Chicago Tribune</i>'s signature general advice columnist, helping readers with questions both personal and pressing. Her column is syndicated in over 150 newspapers nationally and internationally, and <i>Ask Amy: Advice for Better Living</i> is the very first collection of her daily columns, which are read by an estimated 22 million people.<br /><br />Featuring over 200 question-and-answer columns taken from 2011&#x2013;2013, this book is filled with warm, witty, and insightful advice. After taking over for the legendary advice columnist Ann Landers in 2003, Dickinson charmed her way into readers' lives with her sensible takes on etiquette, relationships, and the gray areas of day-to-day life. Her wry humor and practical wisdom comes through in her eloquently crafted tips on problems both personal and professional.<br /><br />Broken down into distinct categories, Dickinson tackles issues ranging from marital to financial, familial to romantic. Having trouble with in-laws, online platforms, or a pesky sibling? Dickinson has answers for those questions and more. She's not one to mince words, and faces the problems head-on with honest and thoughtful advice. 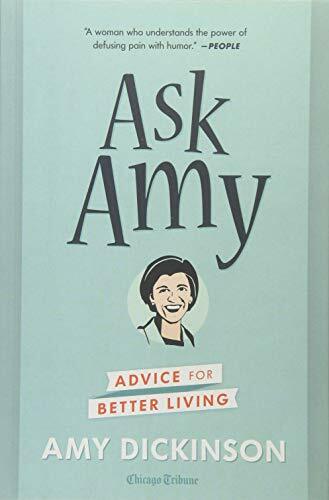 <i>Ask Amy: Advice for Better Living</i> is a great collection to have on hand, written in the tone of a best friend who gives the hard truth and a comforting hand in troubled times.